SAN FRANCISCO, CA — The San Francisco Giants have announced today they have exercised club options for LHP Madison Bumgarner and IF Pablo Sandoval for the 2019 season. Additionally, the Giants have reinstated C Buster Posey, IF Pablo Sandoval, RHP Jeff Samardzija, RHP Johnny Cueto and RHP Julian Fernandez from the 60-day disabled list. Bumgarner’s option is worth $12 million in 2019. Sandoval will make $18 million, nearly all of which will be paid by the Red Sox. The Giants are only on the hook for $555,000, the league-minimum contract. Bumgarner, 29, posted a 6-7 record with a 3.26 ERA in 21 starts in 2018. The left-hander posted a 1.63 home ERA, the fourth-lowest in the Majors and tossed 22.0-consecutive scoreless innings at AT&T Park from August 7-September 28. He missed the first two months of the year with a displaced fracture of the fifth metacarpal on his left hand. 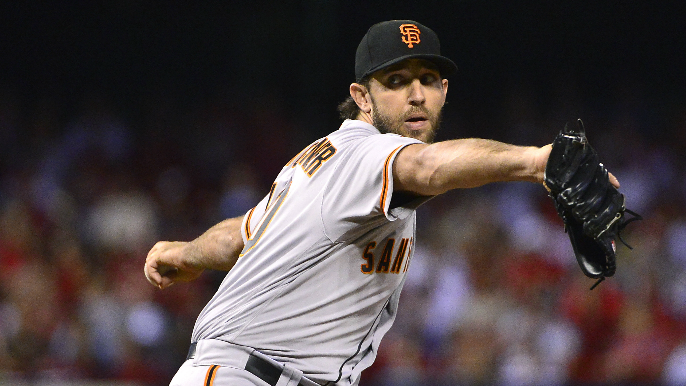 Drafted by the Giants in the first round (10th overall) of the 2007 First-Year Player Draft, Bumgarner is 110-83 with a 3.03 ERA in 255 career appearances and contributing to the Giants’ three World Series championships (2010, 2012 and 2014) during his 10-year career. His 1,591 strikeouts in a Giants’ uniform are fifth-most in SF Giants history and he’s 15 strikeouts away from tying Hall-of-Famer Gaylord Perry (1,606 career strikeouts) for fourth-most by a Giant since 1958. His 110 career victories are third-most in SF-era history. Sandoval, 32, appeared in 92 games in 2018 and hit .248 with nine home runs and 40 RBI. The utility man saw action at first base (24 games), second base (two games), third base (36 games) and came in to pitch the 9th inning in Game 1 of a doubleheader vs. the Dodgers on April 28. Sandoval hit .323 (20-62) with 30 RBI with runners in scoring position while batting .286 (8-for-28) as a pinch-hitter in 2018. His season was cut short after being placed on the 10-Day DL on July 30 with a right hamstring strain. The switch-hitter has posted a .281 average with 134 home runs over his 11-year career with San Francisco and Boston. Sandoval also contributed to the Giants’ three World Series championships (2010, 2012 and 2014). With today’s transactions, the Giants’ 40-man roster now stands at 36.